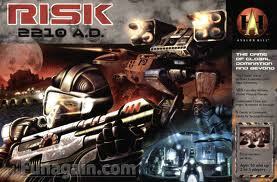 Board Game Store : EuroGames : Strategy Games : Puzzles : Off The Charts Games: Game Profile: Risk 2210 A.D.
Who will be the new world leader? The world is at war. As the leader of one of the warring factions, you control the destiny of your people. On and above the earth you must marshal your forces, send forth your troops, hire the right commanders, and crush your enemies. Enlist the right commanders with the right commands and you can gain the power you need to conquer the world and beyond. Commanders have their own strengths and weakness that can change the balance of power.